Hello! My name is Priscillia Rosalie, you can call me Priscil. I was born on August 9, 1998 in Jakarta. Now I’m studying in Visual Communication Design-Creative Advertising at Binus University. I’m passionate of photography and making layout. I’m a honest and modest person, hardworking, and easy going person. I’d like to learn about new things. 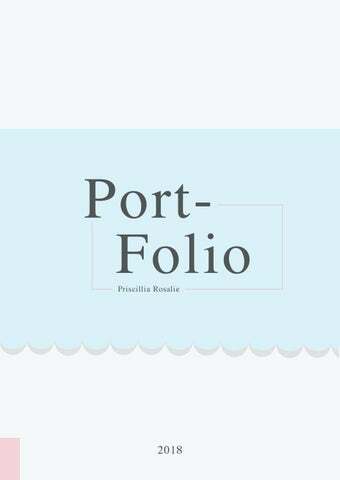 So, this is my PortFolio, please enjoy! Stationary Set This stationary set are made for my personal branding, using a Typography and basic shape approach. My logo is PR, it means my initials name â&#x20AC;&#x153;Priscillia Rosalieâ&#x20AC;?. Using a black and blue color because I love blue and most of all cameras color is black. DeLuVy’s Name Card This name card is made for Deluvy ’s branding. This brand selling a lot of car toys like hotwheels, tomica, etc. It means the audiences are boys or male. So, they used black color for the background and the logo’s color is tosca with a car illustration in the middle of the logo. Travel Magazine The travel magazine is made for typography project, so this project using a typography approach. REISE comes from German languange which means â&#x20AC;&#x153;travelâ&#x20AC;? in english. GrabRental Three Fold Brochure This Three Fold Brochure is made for intoducing Grab Rental at Yogyakarta. Tourism can use Grab Rental with the right price. Jazz Gunung Bromo Poster Event Mount Bromo Jazz is an annual event orginezed by BCA and the local government to increase local tourism specifically in Mount Bromo. I was made this poster using a typography and basic shape with colorful colors. â&#x20AC;&#x153;Because when you stop and look around, this life is Pretty Amazingâ&#x20AC;? Verde Apartment In this section, I made a verde apartment ad for several media are infobank, newspaper, rounded, and Xbanner. The concept is taken from a simple building picture, so the design of the media must be simple and consistent. Head & Shoulders I made a head and shoulders ad for several media are Kompas newspaper, rounded, magazine and billboard.